Now, using the Start PDF Watermark for Mac software, you can easily and quickly mark the Acrobat PDF files with text or image watermarks. 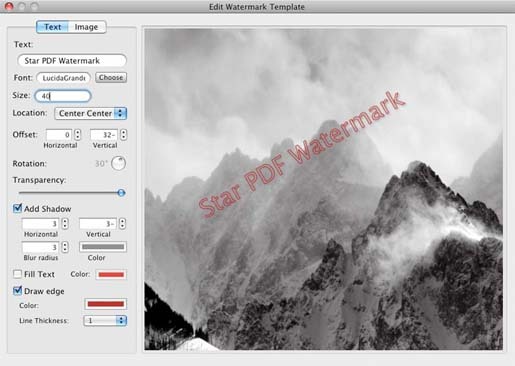 Moreover, it’s possible to add the watermark on each and every page of an Acrobat PDF file. You can stamp your PDF files with your signatures, company name or company logo in order to make them as your copyrighted property. Besides, virtual watermarking is possible for PDF file for every element. You can easily drag and drop the PDF files to this software. You can also double click the watermark the templates or source file to edit the template or preview the result watermarking the PDF files. At the same time, if you wish, you can easily add Rotation, Transparency, Text Size, Text Color, Position, Text Shadow and so on to your pdf document, and you can also add image stamp to your pdf files with Position, Rotation and Transparency.